This chai spiced dessert will warm your heart! 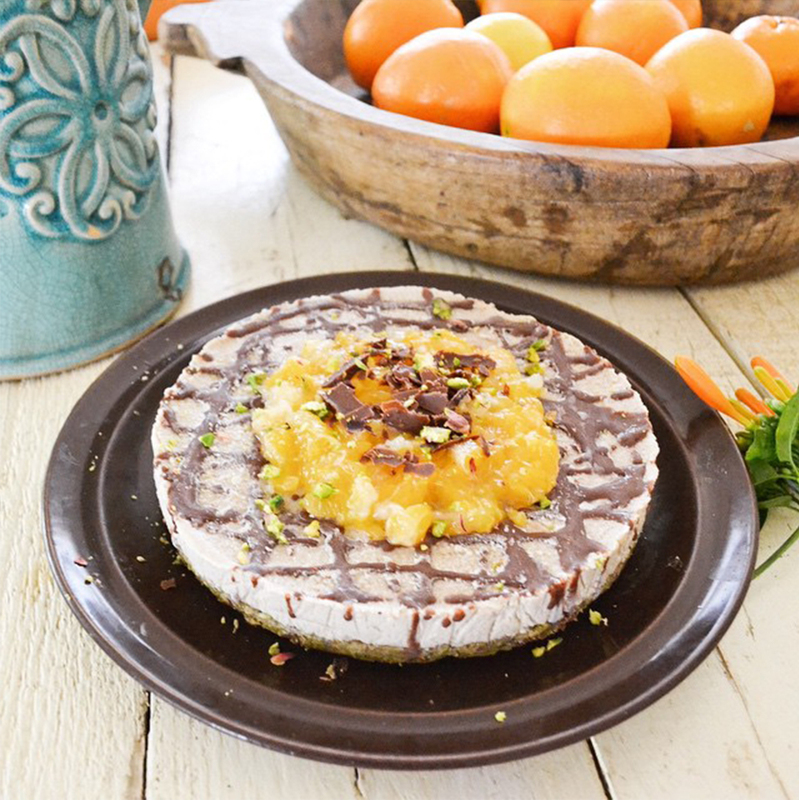 I love making raw no-bake desserts, especially raw cheesecakes! 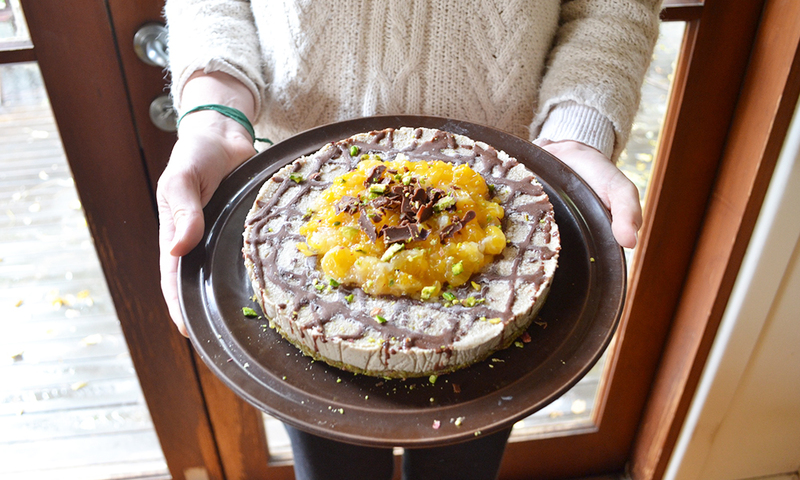 I have experimented with various types of raw cheesecakes like my raw lemon cheesecake slice or raw choc-orange cheesecake balls, but this time I wanted to make something with a slightly more comforting winter flavour. There's nothing like a warm cup of chai tea during the winter. How about taking this exotic mixture of aromatic herbs and spices and combine it with seasonal produce like mandarins to flavour a dessert? Delicious! I have used my own homemade chai spice mix. There is no magic to it and you'll probably have all the ingredients you need to make your own chai mixture at home. After you've tried it, you'll never look back! (Make the best chai spice mix ever). 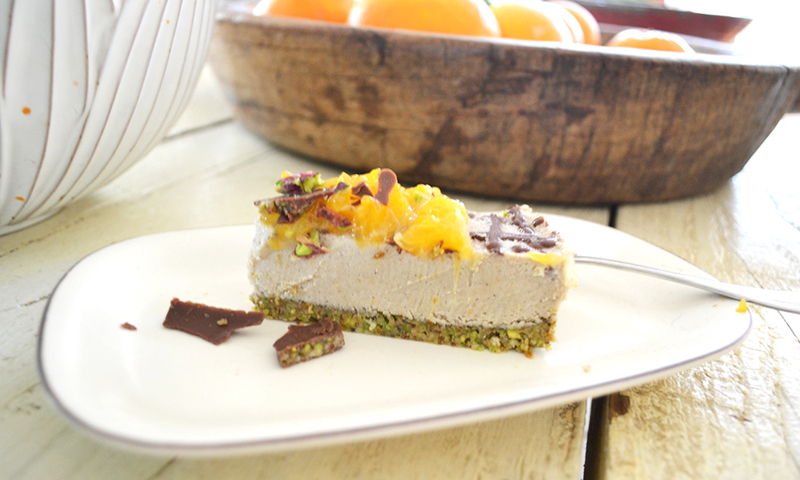 This vegan cheesecake is like drinking a cup of chai tea and eating a citrus cake at the same time! It's perfect for an afternoon or late-night snack. 2-3 medium mandarins, peeled (seedless, or just take the seeds out yourself. This can be easily done after poaching as the mandarins break down and you'll be able to fish the seeds out with a spoon). Soak your raw cashews in water for 4-6 hours. For a quick soak, add them to a bowl and fill with very hot water until covered and allow to soak for at least 30 minutes. MAKE CRUST: Place macadamias, pistachios, dates and salt into a food processor. Process until it forms a mixture that sticks together in your fingers. Press macadamia mix down evenly into a round 9-inch springform cake pan to form the crust. You can use the back of a spoon to help (TIP: Sprinkle a little shredded coconut on the bottom of your cake pan – this is to stop the cake sticking to the pan). MAKE FILLING: Next, blend cashews until they form a fine crumb. Then add in the rest of the filling ingredients and blend together until the mixture reaches a very smooth consistency. Spread filling mixture evenly on top of the base and place in the freezer for 4 - 24 hours to set. MAKE POACHED MANDARINS: Separate the mandarin segments and remove as much of the white pith as you can. Use a slotted spoon to transfer the cooked mandarins to a bowl. Increase the heat to high and boil the poaching liquid until reduced and syrupy, about 5 minutes. Pour over the mandarins and refrigerate until cold. 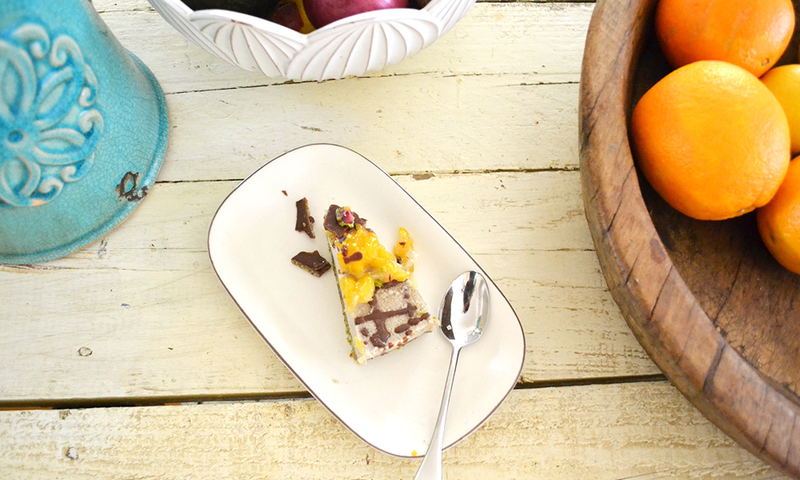 ASSEMBLE CAKE: Remove the cheesecake from the freezer 10-15 minutes before you are ready to serve to let if defrost. Serve with the poached mandarins on top. I have also drizzled on some melted raw chocolate for garnish.